One of the most pointless things a blogger can do is make a post saying “wow, it’s been a while, but I will update soon, promise!”. Still, it has been a while and a lot has happened in that time. I hung up my community moderator hat and joined Stack Exchange as a community manager. I originally started part-time and kept my daytime software gig, but I went full-time at the beginning of May and it’s been an interesting experience. I like to describe the job as “equal parts social experiments and tech support”. I love coding. I did primarily testing/integration work. Totally by choice, but turns out that’s not my thing. I love being able to learn and contribute in various areas. The company was set up to strictly separate responsibilities. I need to know that I’m making some sort of a difference and the things I do are being used out there. This was actually pretty well covered. The software we built does some really awesome stuff. But it still doesn’t compare with working on something like Stack Exchange where you get feedback (good and bad) daily and directly. I look at my time in my last position as a great learning experience. It taught me a lot about what makes me tick. The job ultimately wasn’t doing it for me, though, so I quit. There’s a little app I’m writing to extract SMS and iMessage records from an iPhone backup. Turns out all that is stored in a Sqlite database. The schema is a bit weird, but other than that, it’s pretty easy. Still got a lot of polishing and refactoring to do (and I don’t promise it won’t eat your computer or your backups somehow), but it works! I’ve been learning Django and catching up on my CSS, helping extend the website for a local Python group. I also finally started going through Seven Languages in Seven Weeks, among catching up on other reading. Will I get back to programming for a living? Maybe. Probably. I’d like to, but for now I’m content to just go with the flow. Stack Exchange is basically my dream employer, and I’m using this time to beef up my skills and do a few things I’ve been meaning to do for a very long time, all while doing something I also enjoy during the day. It’s a fantastic spot to be in and my only plan right now is to see where this takes me. Are you telecommuting or did you relocate? About Seven Languages in Seven Weeks: I’m currently reading Sever Databases in Seven Weeks: A Guide to Modern Databases and the NoSQL Movement and I found it very valuable. I really love the concept. I’m telecommuting at the moment. 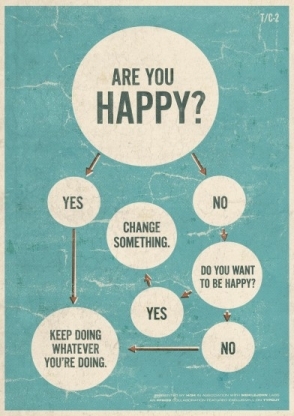 NIce flowchart. I think I want that for my wall. This is a great post! I totally agree with you that people are not defined by their job. And it is good you are into programming. Programmers are not those who can write code. Programmers are those who cannot not write code. Oh and yeah, software programming languages are all very similar (at least to me, be that OCaml or Assembler). If you want to experience some altered state of mind, get some Digital Design book and learn a bit of Verilog. Just my five cents. At any rate, hope you will be getting happier and happier and realize your potential. Getting stuck is no good! Good Luck!